Santander competition judges Diane Roberts, Dr Siwan Mitchelmore and Prof John G Hughes present a cheque to Dr Ned Hartfiel. 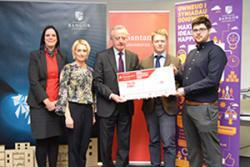 Three Bangor University students are have been selected to represent the University in the regional finals of the Santander Universities Entrepreneurship Awards competition. Having competed against over thirty entries to be selected as the final shortlist of six student projects, PhD graduate Ned Hartfiel and Psychology Masters students Alex Bailey and Daniel Pascoe were awarded a cheque for £200 for their entries, and will be eligible for business support through B-Enterprising at the University’s Careers & Employability Service. The six shortlisted applications were invited to present a short video and to pitch to the Bangor University judging panel of Professor John G Hughes, Vice Chancellor; Diane Roberts, Santander University Relationship Branch Manager and Dr Siwan Mitchelmore, Lecturer inBusiness at Bangor Business School. Dr Ned Hartfiel successfully persuaded the judges of the merits of his Healthy Back Company. Already trading, he won the Post-revenue category. His company delivers a healthy back programme, which addresses the issue of back pain and sickness absences in the workplace. Having completed a postgraduate degree in Health Economics, Ned is now winning corporate clients for his workplace yoga-based programme, which he has delivered to employees at Conwy County Council, the Merseyside Police, and Great Ormond Street Hospital in London. Research conducted by Ned for his PhD, showed that employees practising the Programme over six months had far fewer days off sick with back pain than a control group. 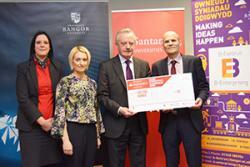 Ned said: “Winning the Santander competition at Bangor is a great boost for our company! Over the next few weeks and months, we will benefit immensely from all the ongoing support provided by the B-Enterprising Team. Our goal, our course, is to win both the regional competition at Northumbria University in June, and the finals in London in October. Alex Bailey and Duncan Pascoe receive their cheque to support their 'love Box' proposition.Two students won the ‘idea’ category of the Awards- for a company not yet trading. Alex Bailey and Daniel Pascoe presented their pitch for Love Basket- a mail-order delivery company using a novel approach to deliver merchandise for sexual health and happiness. Twenty three year old Duncan Pascoe, from Horsham, West Sussex is following an MSc in Consumer Psychology with Business, after completing an undergraduate degree in Psychology with Neuropsychology at Bangor University. He said: “Winning really validates our idea and has given us a huge boost in confidence to find success with our business. We're more motivated than ever, and we're hungry for that first prize. The next step is to get ready for regionals, with a more refined business plan, more market research and hopefully a few protypes to show off. 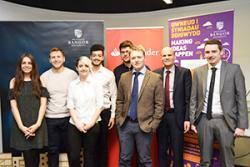 The shortlisted Santander Entrepreneurs were (l-r) Maisie Prior, Wil Philbin, Rhiannon Quirk, Ibrahim Kawasami, Duncan Pascoe, Alex Bailey, Ned Hartfiel and Robert brooks.Bangor’s students now have the opportunity to compete against other student entrepreneurs in the regional competition and if successful, to compete for a package of £25k of seed funding, mentoring and support, exclusive access to an acceleration week and a fully funded intern from Santander Universities in the UK finals. The other shortlisted finalists were Rhiannon Quirk, a Product Design graduate from the School of Education with her Little Quirks Plush products. Robert Brooks, a School of Ocean Sciences student with his Finding Nature business idea, Maisie Prior, writer and a 4th year linguistics student studying Spanish with International Experience and Peer writing mentor for Student Services, with her Pip & Dip Languages product range and 3rd year Business School student Ibrahim Kawasmi, who, with Bangor graduate Will Philpin, owner of ‘Willpin Visual’ pitched their joint-business, When It Rains Creative. All the finalists have received support through the Welsh Government’s Big Ideas Wales programme.